I have lost count but I think I have had the pleasure of spending 6 weeks on the McGregor II. It has surpassed all of my expectations on every level. The food beyond amazing, the beauty above the water incredible, the life below breathtaking. Our every need is always catered to, from dietary restrictions, daily activities, and music selection. The Captain is a Dive Master and he literally held my hand for two years until I was comfortable and ready to dive on my own. The years that I have chosen to travel to other destinations have left me wishing I had spent my vacation dollars and time on the McGregor II. I won't miss out this year. We have been on McGregor II numerous times and have never been disappointed. Tim & Julie work so well together they make the whole experience delightful and fun. Chef Julie not only serves awesome food but her presentation is OUTSTANDING! She makes it look so easy. 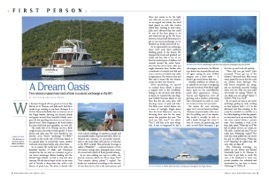 Captain Tim , having lived in the Virgin Islands for 30 years, know the area very well. Water activities are abundant; snorkeling, paddle board, kayaks, scuba, etc. Tim is a master diver and is very patient with first time divers. 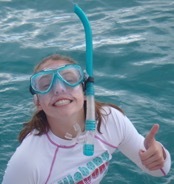 Julie is also a scuba diver so both make you feel very comfortable in the water. McGregor II is in A-1 condition due to their hard work. If you want to have a great time, book McGregor II…you will not be disappointed! WOW!! What a fantastic week. The weather, the food (five stars all the way), the dives and the snorkeling all great. Thank-you both for this wonderful experience. A friendly and relaxing atmosphere at all times. Much attention to detail (as they say, “Love is in the details) You make it look effortless, but we know and appreciate all of your hard work. We will definitely highly recommend this charter to friends and family. We hope to see you again. We wish you continued success in you r charter business. Again, thank you, we just had the best time ever. What a week! Between all the snorkel adventures, excursions, swimming, jumping off the boat, beautiful beaches, and memorable bar trips (what may or may not have gone down at the Willy T). I’m sure my family and I will have no shortage of great stories/memories from our week on McGregor. Not to mention Julie’s world class cooking every day. I think it is safe to say we were pretty spoiled, and I’d be lying if I said I was looking forward to heading back to icy upstate NY. We shared a lot of stories and laughs, and there were definitely some wild nights. But normal is boring, right Captain Tim? Thank you so much for a great time! Hope to see you both again soon! WOW! How do we begin to thank you both for the BEST family vacation ever?! From the moment we first stepped aboard McGregor II, we know this was going to be outstanding. There were so many highlights that I could mention but I would fill your book. But the greatest part was experiencing it all with you both. Thank you for sharing your love of life, “Sittin’ on Candy,” grace, superior boating knowledge, respect for the sea and all it’s inhabitants and of course your “religion.” We feel blessed to know you and hope we can meet again. Please let us know if you ever come to Atlanta. Again, thank you so much...be good, stay safe and keep “Sittin’ on Candy:...it’s working for you. You guys haven’t lost the joy in life! Ti’s clear you love what you do. We hope you two and McGregor II will be cruising the Caribbean for years and years to come. We enjoyed celebrating our in-laws Keith and Sharon’s B-Days and 25th Anniversary. 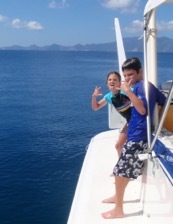 The kids, Gianna, Milana and Heston really have experienced the best the islands have to offer with you - Lee and I also loved living “The Life” for a few days and more than a few rum punches. Thanks for making our memories of this time on the planet earth AWWWSOMMME!!! We love Y’all - God Bless you both - Safe journeys always! Thank you for an AMAZING vacation! The snorkeling and SCUBA diving was fantastic and I’ll always remember the beautiful life under the sea! I loved seeing Turtles everyday! 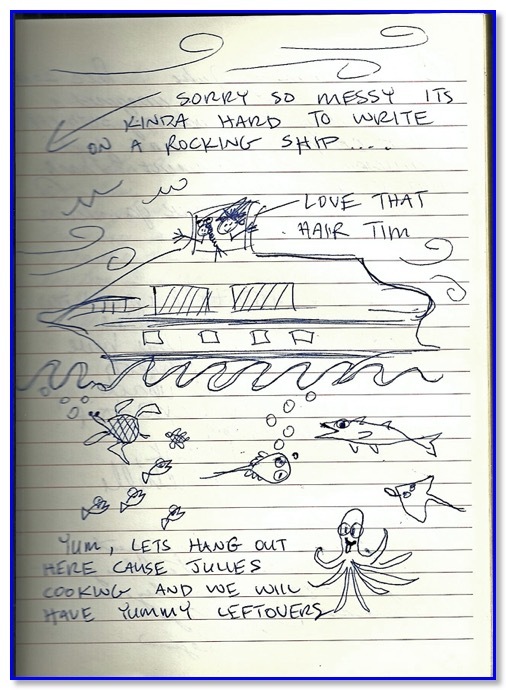 Tim, you are the master Master Diver! The food was insanely good! Thank you for letting us enjoy your home for a week and keeping it fun! Keep a look out for us in our Airstream! We’ll be by to see you in CO! 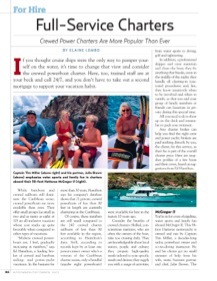 Having just returned from an 8 day cruise on McGregor, our 40th+ charter in the US and British Virgin Islands, it is a good time to review our charter experience. This was one of our most comfortable and enjoyable trips. McGregor is an outstanding boat. The salon is high above the water with picture windows, giving guests an open feeling indoors. The master cabin is exceptionally large. The transverse situated bed minimizes any feeling of rolling – we slept like babies. Outdoor dining had great views. The "play deck" allowed for storage of gear – out of sight from other areas, and an ideal area to gear-up for dives. The bathrooms had large showers and plenty of storage space. We enjoyed the high views from the fly bridge when underway. The tender was good sized and had an exceptional ride in choppy seas. A boat, no matter how luxurious is only as good as its crew and you are among the best. Both of you have a high degree of professional competency combined with huge enthusiasm for everything you do. Julie has a sparkling personality and a winning smile. She is not a cook – but a gourmet chef. The meals were outstanding, a highlight of the trip. Daily fresh baked bread and cookies are not something one would expect on a charter cruise. 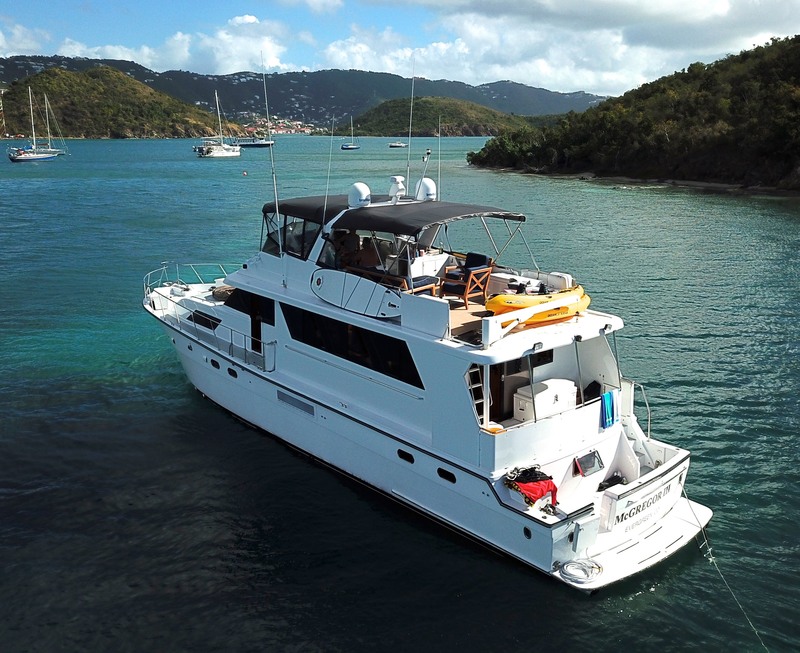 Captain Tim with his extensive experience in the US and British Virgin Islands knows the best anchorage and dive sites. Our dives were comfortable and easy. We always felt safe. Tim accommodated our choices for various dives advising us which would probably have less current and more sea life. He kept McGregor well maintained and shiny clean. In confirmation of our telephone call, we would like to confirm that we had a great time, and our only complaint was that we didn't book more days. The boat is great, and is much more spacious than bigger sailing yachts. Having an outside dining room made meal times special, and the food was wonderful. Julie made everything herself, even the bread, and never 'bought in' anything, even the pastry was prepared fresh. They are a very happy couple, and very into each other. Both were happy and smiling from the time they got up to the time we went to bed. As you know, my 18 year old son came with us. We thought he would be bored as we tend not to go ashore. He had the time of his life, swimming and snorkeling, and Tim taught him to water ski, up to getting onto one ski, and to scuba dive to a depth of 40 feet. His best vacation ever - his words, not ours. Ann and I were slightly less energetic, but spent a lot of time snorkeling and kayaking, and because Tim and Julie own the boat, everything works and is in first class condition. As someone who has owned three boats, from 28' to 43', I hate going on a boat which is not in good order. I have hired boats with berths, with or without crew, on the Broads, Loch Ness, the Shannon, Corfu, Florida and BVI, and can honestly say that McGregor is far the best, and after four tours of the BVI, both the boat and the crew were far better, even though we do not have any complaints about the rest. Whether a booking is for two or four adults, or a family with children of any age, this one is the best, and we will be going again next year. We are also interested in a hire in the Med., and would appreciate any information on this, as I have convinced Ann that boating holidays, with a crew, is the best way to go. Praise also has to go to you. Both of you are well in tune with your Client's needs, and work hard to ensure we have a good time. “This was a week to remember! It was greater than we could ever imagine. Thank you for all you did for us. We truly felt “cared for.” Tim, you make a great reverend! Thanks for assisting in the renewal of our vows on our 50th Anniversary. Julie, you are a super chef and gracious hostess. You and Tim make a great team. Tim and Julie’s charters on McGregor II provide all the hoped for activities and amenities, but also so much more that is special and unique. Our two vacations with them have been perfect family getaways in all respects. They are the consummate hosts to adults and children. Yes, the boat is very spacious, well-equipped and comfortable. Yes, Tim knows all the best snorkeling, diving, sunning, and exploring spots, and plans the trip with us to minimize the sea time it takes to get there. Yes, Julie’s meals, snacks and desserts are out of this world, creative, using the freshest ingredients and making a gorgeous presentation. Yes, the bar and coolers are always well stocked. Yes, Tim is a fabulous instructor in all water sports, including snorkeling, diving, screaming, skiing, kayaking, and both Tim and Julie are insatiable card/board game players extraordinaire. Yes, the water gun arsenal is impressive and Tim makes sure there are many opportunities to test it. Yes, Tim is a calm and expert boatman and Julie a perfect first mate! Yes, We’d never charter with anyone else. BUT, how many trips also include helping our children retrieve a ripe coconut from an island, and cracking it in the spirit of castaway survivors. Or night snorkeling to Jethro Tull’s Aqualung, live dancing around the boat to Santana and marathon games of Scattagories, Taboo, Cards, Pick-up-Sticks and charades. Or, Julie taking us hiking to incredible panoramic views. Or Tim making certified divers of us. Chartering McGregor II is a wonderful combination of gracious hospitality, meticulous service and zany camaraderie. Thank you Julie and Tim. Our family is better for the experience and we look forward to many more to come! For making this vacation so great! !